I have, for over a year now, been on a crusade trying to get them to stop sending me their Dell Home and Home Office catalog to my mailbox. It has been a bundle of fun, let me tell you. Now, unfortunately I feel compelled to bore you with the saga so far, involving telephone hang-ups, broken privacy policies, and the like. 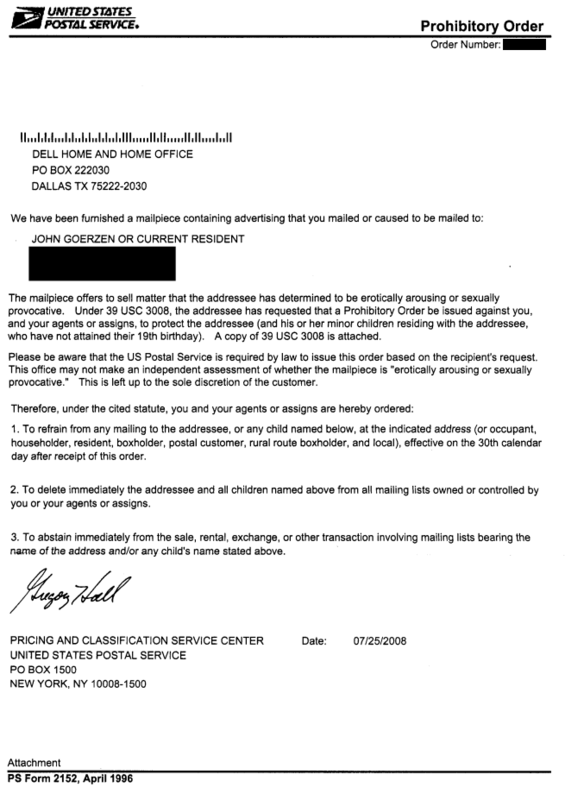 But there is a silver lining at the end, in which I submitted a request to the postal service asking them to block Dell from sending me any more mail, and it appears that they are very likely to violate Federal Law any day now. I have called them about it. Dealt with the old “let me transfer you to the correct department” then hang up on me ploy. Spoken to people that have promised up and down that I’ll be off their list in 30-60 days. It’s always 30-60 days, isn’t it? Very convenient that I can’t tell for 2 months whether or not they’ve processed my request. Ah Dell, only you could reach such a pinnacle of customer service. /kicking someone out of a chat room before they have a chance to say a word. inconvenience you may have experienced. So that was October. In December, I replied to that message, saying: “I received another mailing today, and it’s been nearly 2 months since your initial message. If there’s anything further you can do, I’d appreciate it.” Debbie said, “I am very sorry Mr. Goerzen, I will resubmit your request.” Guess how successful that was. I keep getting your Dell Home and Home Office catalog. I have tried for months to get off your mailing list. I have called in, talked to people in multiple departments, who have promised to remove me from the list. I have contacted you online. NOTHING IS HELPING. This has gone on for MONTHS. PLEASE NEVER SEND ME MAIL AGAIN, EVER, AND DO NOT RENT OR SHARE MY NAME. I replied, saying that form didn’t work. Guess what I got back? Thank you for signing up for Dell Email Subscriptions. Please save this email for your records. Yes, that’s right. Asking them to take me off their postal mailing lists got them to PUT ME ON their email lists. ARGH. So they eventually manage to correctly take me off the email list, and of course promise to do the same with the postal list. This back in February. I contacted them again in March and July, only to have a similar stupidity-laced run-in with clueless form-answer-laden Dell support reps. Each one claimed to have now, finally, and permanently removed me from the list. It never happened, and none of them lifted a finger to find out way, and no amount of begging could make them. So, here’s the good part. Somehow I get a chuckle over some Dell mail clerk trying to figure out how an 11-pound laptop is sexually provocative. 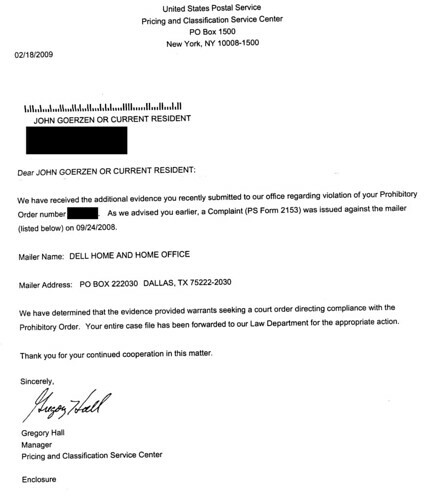 From August 25 on, it is a federal offense for Dell to send me another Home and Home Office catalog. This is a branch of criminal law, not civil law. That is, it’s the maybe-go-to-jail branch of law. How disappointed I was to receive yet another catalog from them today. If only they had waited 5 more days, I could have turned them in now. Oh well. There’s always next month’s catalog. Let’s just hope the clerk that received the USPS letter removed my name with a better system than everyone else at Dell uses, eh?